2016 Woolly Worm Winner is HANS SOLO! Since 1978, the residents of Banner Elk nestled between the Carolina’s largest ski resorts have celebrated the coming of the snow season with a Woolly Worm Festival. They set aside the third weekend in October to determine which one worm will have the honor of predicting the severity of the coming winter; and they make that worm earn the honor by winning heat after heat of hard-fought races – up a three-foot length of string. 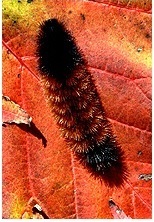 The Woolly Worm caterpillar has 13 brown and black segments, which the late Charles Von Canon explained to the small crowd that huddled together in the sub-freezing temperatures at the first Woolly Worm Festival correspond to the 13 weeks of winter. The lighter brown a segment is, the milder that week of winter will be. The darker black a segment is, the colder and snowier the corresponding week will be. The Woolly Worm races begin around 10:00 a.m. Each heat consists of 25 worms and races continue all day until the grand final around 4 p.m. The winning worm on Saturday is declared the official winter forecasting agent. The Sunday worm races are for prestige, fun and small prizes. In addition to the Woolly Worm Races, the festival features crafts, food vendors, live entertainment and much more. Last year’s festival attracted an estimated 23,000 fans, 140 vendors and around 1,000 race entrants. The Woolly Worm Festival is sponsored by the Avery County Chamber of Commerce and the Kiwanis Club of Banner Elk and a portion of the proceeds go to support children’s charities throughout the county and small business and tourism.